Is there anything better than a fabulous product at an even more fabulous price? Maybe not. But the combination of the two is actually harder to come by than many people think. Before you blow your budget on that next “crazy deal”, get the scoop on what could make a sale-priced purchase a horrible idea. It’s not discounted, at all. Before you drop a dime, take a moment to investigate the nature of this “sale.” Is there an original price on the shelf that you can compare with the “new” price? Can you lift the sticker on the product packaging to see what previous price sticker may lie beneath? Stores are notorious for marking down an item with such a small discount (two pennies, in some cases) as to make it an uneventful occasion. 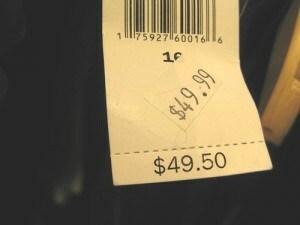 Other stores have been known to mark a price up, then down, and then try to cover it up with a new price sticker. While one of these tactics is clearly more ethical than the other, neither will put the purchaser in a great financial position. A sale should be declared as merely lip service until proven otherwise. The sale item isn’t what it seems. Going to the store to grab a box of cartful of cereal for a buck apiece may seem like a great way to spend an hour of your time (and some gas money.) Getting to the store, only to realize that the advertised cereal is one third the size of a typical box of cereal is not, however. Special-order items are sneaky ways for stores to lure in customers who are looking for a cheap fix, but only those who take the time to compare sizes and quality can avoid being taken. Always calculate the price per ounce of any item you buy regularly, and consider keeping a price book for maximum savings. While some of the sales may be legit, many are just an average deal dressed up in disguise. I’ll admit to being taken in by a too-good-to-be true deal. I purchased a lovely pillow for my newborn baby to help support his head when being fed. The pillow usually costs $30 or more, but I found it at a big-box retailer for a mere $12. There was an “as-is” sticker on the packaging, but the customer service rep assured me that it was because it was returned in an unopened state. Opening it up at home, I realized that the actual pillow had been switched out with a homemade knock-off worth nothing (and falling apart, to be specific.) I was unable to take it back to the store due to their “no returns” policy on “as is” items. I was clearly the loser in this deal. Buying items that can’t be returned, no matter the discount, can be a bum deal. Buying things that are in “as is” condition, can be, as well. Unless you are absolutely certain that you can vouch for the quality of a sale-priced item, open-box, scratch and dents, and closeout items not covered by the store or manufacturer’s warranty should be avoided. The number one cause for making a sale a horrible deal is simple: you could live without that item for any number of reasons. Maybe you don’t like green, you’ll never actually lose the weight required to fit into a given outfit, the appliance is too big for your living space, or polishing off an entire box of gluten-free brownies sounds like an exercise in slightly off-taste gluttony. Unless it will fill a true purpose, bring you lasting joy, or can in some way bless someone else in your life, skip it. We’ve all had buyer’s remorse on a purchase that sounded like a sweet deal at the time. Learning from these mistakes will make us a better shopper in the future, provided we slow down, think a bit, and let our wants take a backseat to our needs. What other ways can a sale be a bad deal? Share your stories! This reminds me how I always state “I will not buy anything at Canadian Tire as it will eventually be on sale”. The mark up on items at some stores is ridiculous and while their sales may be @ cost price it is obvious how much price gouging goes on at some retailers. Feel free to edit out the company name from my comment! They are one of the worst however where items are routinely (through out the year) found to be 50%-85% off the “regular” price. I do shop there but I wait for the weekly flyer. This reminds me I need a new shop vac, I hope they’re “on sale” this week! Most of the stores now-a-days follow various sales promotion techniques for their targeted customers. As a matter of fact most of the sales promotion techniques aim to convince the customer that the deal is the best one. That’s why the shopaholics are easily carried away with the offer and in turn huge profit goes to the retailer. However I think it’s worthwhile to mention that a lot of purchases made during the offer are bad purchases since buyer only aims to grab the offer. Here the requirement comes in second place and stimulus of utilizing the offer comes first. Such purchases are definitely bad purchases and should be avoided. More importantly as an affluent buyer we must be in a position to decide which one to purchase and which one to avoid. This article brings up great points that one should not immediately make a purchase when the word “sale” is used.